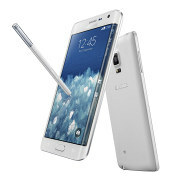 The Note family added a second new phablet today, the Samsung Galaxy Note Edge. The name isn't random, the right edge of the screen folds to cover the side of the device and enable unique interactions. So, not the three-sided screen of the rumors but two sides are unique enough. The Galaxy Note Edge is based on the Galaxy Note 4 internally, but it's the screen that makes all the difference. The folded side adds an extra 160 pixels so the resolution grows to 1,600 x 2,560 (the highest on a pocketable device yet if you keep note on those things) but it also makes the Galaxy Note Edge a bit wider than its straight-screened sibling. Samsung has added enough smarts to the curved side that accidental touches to it are not a problem. With the phone locked, the curved side can display the Quick Glance info (time and notifications). When you wake the screen, the side displays notifications for various features, including timer and flashlight shortcuts and even a ruler (which works surprisingly well on the curved side). With the phone finally unlocked, the number of options grows threefold. You can keep shortcuts on the side for easy access or use the curved side for at-a-glance info (say a Twitter feed or a stock ticker). Or you can use it to enhance multitasking by switching between several screens (think virtual desktops). Event switching between the pages of the homescreen or the app drawer is also handled by the curved side. Individual apps can put the curved side to use too, usually to keep the main screen free from clutter. Both the camera and the video player put their controls on the side so the screen is left to the viewfinder/video. Samsung will release an API to enable third-party devs to utilize the potential of the curved side as well. As you can imagine, the Samsung Galaxy Note Edge experience revolves mostly around the curved side of the screen. Beyond that it's a Galaxy Note 4 with Snapdragon 805 or Exynos 5433 chipset, Android 4.4, 16MP OIS camera and S Pen stylus. The Note Edge has a slightly smaller battery (3,000mAh vs. 3,220mAh) and the USB port moves back to version 2.0. The Samsung Galaxy Note Edge is expected to launch by the end of this year. ,,,, it not even on the market yet???? how do you know? bali,, where are you from,,, the note 4 is not even released yet (as of sept 12, 2014) release date is still October,,, so are you saying you already have a note 4? how can you be disappointed with a product that is not even on the market yet??? ?